Two civil rights groups, the Center for Constitutional Rights (CCR) and Color of Change (COC), have filed a motion asking a judge to force the Department of Homeland Security to un-redact a mysterious document known as the “Race Paper.” Following FOIA requests, the DHS turned over hundreds of pages to CCR and COC, but has fought releasing the so-called “Race Paper,” as its referred to in internal DHS emails. Little is known about the document, including its actual title, though COC and CCR believe it is potentially related to data-driven surveillance of protestors. However, when the DHS handed the mysterious “race paper” over to the civil rights groups, it was redacted into oblivion, with nine full pages of completely obscured text. The “Race Paper,” as its referred to internally. Little is known about this document, but lawyers believe it may be related to surveillance of Black Lives Matter protestors. All references to its actual name have been redacted. “There’s not too much wiggle room when something is called ‘The Race Papers,’” Stephanie Llanes, one of the CCR lawyers filing the motion, told Gizmodo. Here’s what we know for sure: the paper is a nine-page document put out by members of the DHS Office of Intelligence and Analysis. The DHS worked on its creation for months, producing multiple draft versions, all of which have been redacted. The Office of Intelligence and Analysis specializes in “information sharing and delivering predictive intelligence and analysis.” The office operates a network of Fusion Centers, which specialize in intelligence collection, analysis, and sharing between “state, local, tribal, territorial, and private sector partners.” It follows, then, the paper may relate to predictive technology or surveillance. It’s speculative, but police have used data analysis to surveil minority protestors in the past. 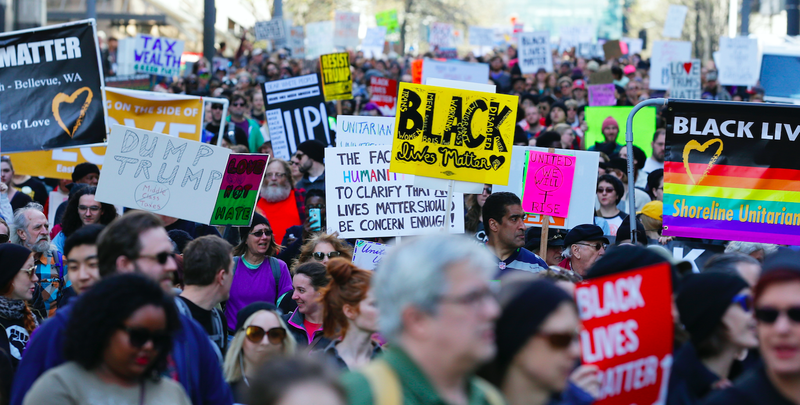 From Massachusetts to Missouri, officers have used complex data-mining software that could provide the locations of social media users to monitor protestors using the #BlackLivesMatter or #MuslimLivesMatter hashtags. Being asked to produce the “Race Paper” and then handing over nine all-black pages might seem like a cheeky response, but, incredibly, the DHS argued that the documents, redactions intact, satisfy the FOIA request. The DHS insisted it is exempt from releasing all preliminary versions of the document because, as they were draft versions, they “wouldn’t be an accurate assessment of what the agency thinks,” Llanes explains. However, the DHS redacted all versions of the document, including the final version, which seemingly would accurately represent the agency’s stance. DHS argued that even partially redacting the final version would threaten national security by revealing sensitive information about how the agency operates. CCR lawyers are arguing that, under FOIA law, the DHS has a duty to un-redact passages that are based on unclassified facts or public knowledge. By completely redacting every single word, including even the title of the document, the DHS is essentially claiming that every single detail of the “race paper” is, to some degree, sensitive, classified, or private. The next step in the case is for the DHS to reply to the motion. If they deny the lawyers’ claims, the case would move onto oral arguments.